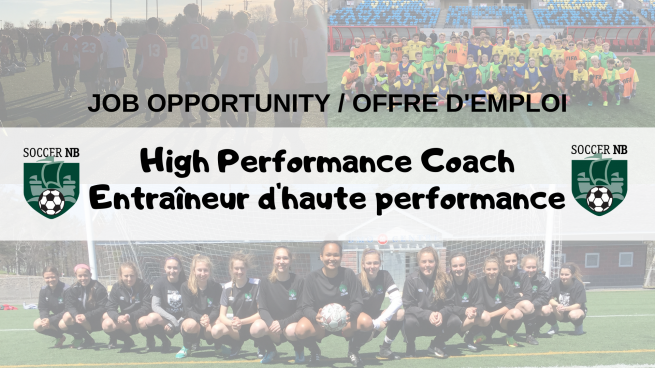 Soccer New Brunswick is seeking an experienced and energetic Coach who will work in partnership with staff and volunteers to advance High Performance Soccer in the province of New Brunswick under the direction of the Executive Director and Technical Development. The ideal candidate is committed to working on a day to day basis with New Brunswick’s Train to Train and Train to Compete athletes. This will occur in a Training Group setting leading to improved national results and stronger national team presence. This is a full-time, 3 year contract position.. The Coach will be expected to contribute to the culture of high performance sport within the province of New Brunswick. CSA National A Licence or equivalent. Minimum of 10 years coaching experience at an elite level, preferably at a youth professional Academy. Playing experience at an elite or professional level. Excellent communication skills and the ability to work effectively with a broad range of people. Ability to speak both English and French is an asset. Provide the required criminal record check with their application. Be in good standing with Soccer New Brunswick and associated programs. Be knowledgeable in the Long Term Development Program. i) Candidates may be invited to attend an interview. Only selected candidates will be contacted. ii) Coaches will be required to demonstrate their soccer knowledge and management skills and coaching experience. Demonstration may include conducting of a practice session or sessions at a designated time and place. By 4 pm on March 29th, 2019.